It's actually Spring here in the land Down Under and while it's been a really cold start to Spring, it's finally warming up. Click on the image below to learn more about the Counterfeit Kit Challenge. I decided to break down the inspiration kit down not only into its constituent parts, but also into the colours, patterns and motifs. This helps me decide how much I want to mirror and how much to change up. 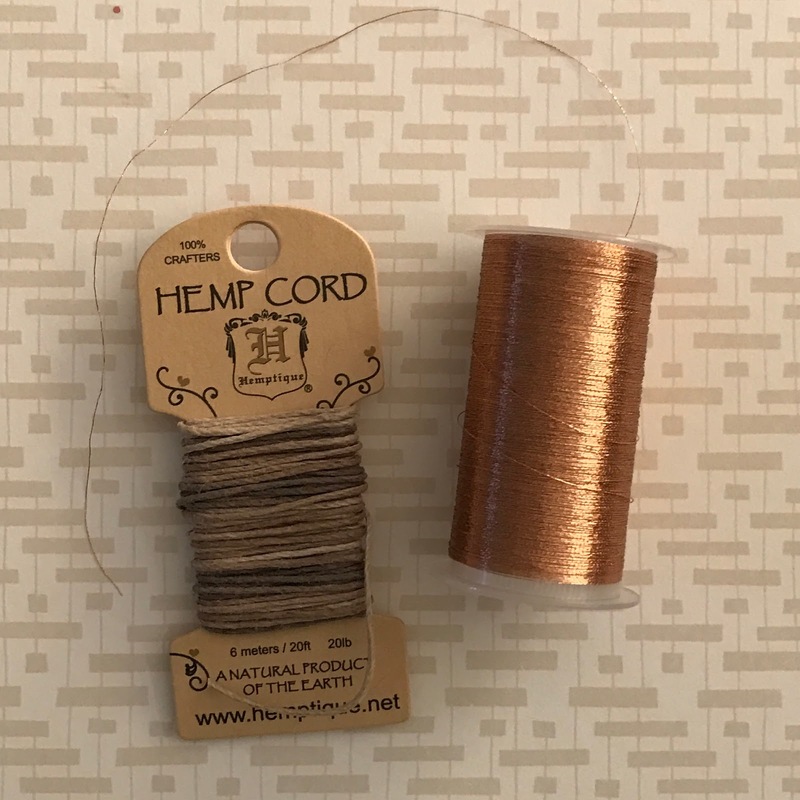 Mine has pretty much the the same, but with different proportions (less orange and brown) and med-navy blues rather than purples...and a bit of copper/rose gold in addition to yellow gold. The first and most noticeable change I made to the kit was to swap the pumpkins with apples since they are more synonymous with Autumn here - at least for me! And adding a few doilies and hearts rather than stars. That brings it up to 20, but we'll call it 25. I managed to whittle it down to half that, but not beyond. I'm going to roll with it, but it will mean embellishments will need to be about double too. Here is the overview of my kit - let's call it "Falling into Spring" because I'm a klutz and...well...we ARE going into Spring while the top half of the world does Autumn or fall. Each set of pictures shows the "front" of the papers in the top image ("front" being what I think will go best with the kit). The bottom photo in each set shows the "back" and most of the time it's an equally good match! 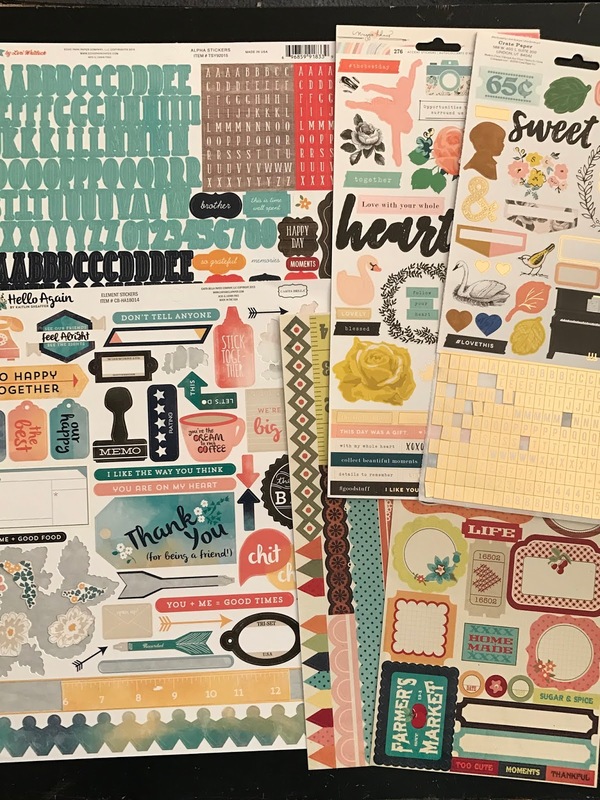 ABOVE LEFT: These six papers are all from Shimelle's "Go Now Go" collection which is actually an Autumn collection with a travel feel...or should that be the other way around?? 🤔 Hmm...Both sides of the papers I chose went equally well with the colours and feel of the kit that I was trying to portray, so it was a bit challenging to nominate a "front". At times I left that decision til all the rest of the papers were chosen and went back to fill in "gaps" in the colour scheme. 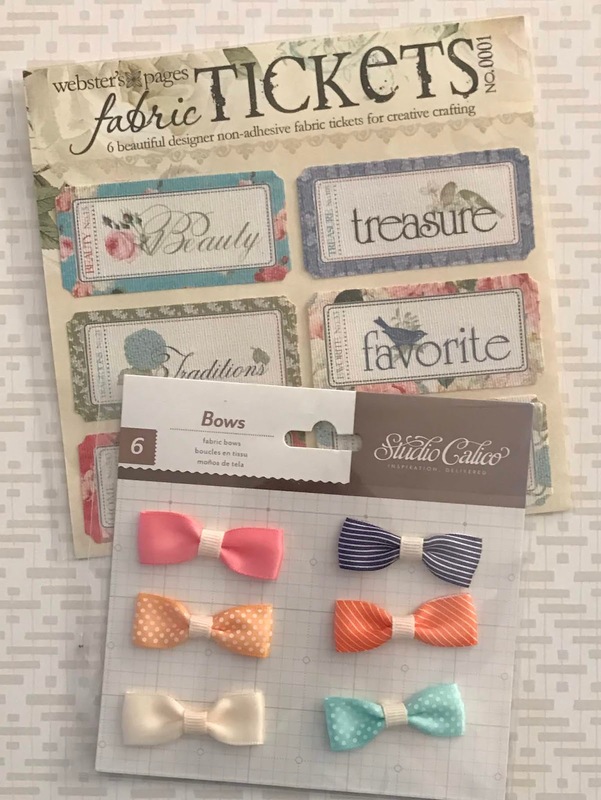 ABOVE RIGHT: The first three papers are Maggie Holmes and other two are from different Amy Tangerine collections. This was another stack of paper where both sides suited the kit very well. ABOVE LEFT: A bit of a random mix: * one from My Mind's Eye, two from Lilybee and two from American Crafts "Campy Trails". ABOVE RIGHT: The first four papers are October Afternoon and the remaining three are Fancy Pants. The apples on the blue OA paper reminded me that I wanted to include more papers with apple motifs. This does mean I need to remove the same number of papers, otherwise it will upset the nice neat, even number of papers. ABOVE RIGHT: These papers are all Echo Park from several different collections ranging in theme from Autumn to family to camping. These colours are exactly what I wanted, since they're brighter and more varied than the typical brown and orange of Autumn, so they'll work with almost any kind of photos. 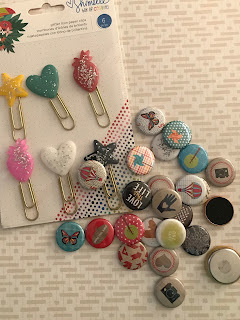 ABOVE LEFT: Four from various Studio Calico collections and two from Jillybean Soup. 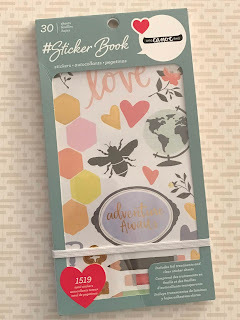 There was a bit of Jillybean and butterflies featuring more than once in the original inspiration kit. 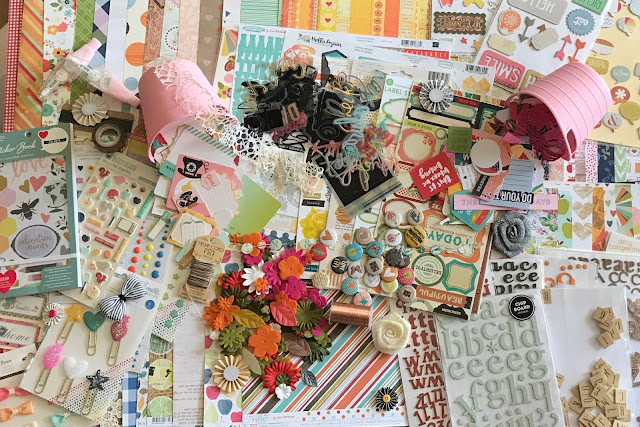 ABOVE RIGHT: These four papers are all from Bella Blvd which are well known for their very bright colours, The middle two are from an autumnal collection, but I needed to mix it up especially given the back of the orange woodgrain paper. The cut aparts are just not the kind of thing that is useful here in Australia even in the Autumn. ABOVE LEFT: The first three are Pebbles and the coloured hearts are Simple Stories. The hearts look as though they have been stitched which is perfect since some of my paper choices feature printed doilies or other fabric detail. This also works well with an autumnal kit since knitting and sewing seems to be a theme in those papers and colder weather certainly means wearing jumpers and scarves! I definitely needed more than the single pack included in the inspo kit. Even if I had the same number of sheets of paper as the inspo kit, I'd still need more than one pack. I like mixing fonts in my titles. I went back to my Thickers and pulled out a bunch of packs that were partly used and very worse for wear. They have been stored fairly carefullt, but the chipboard ones always seem to fall off the backing causing a huge mess. I kept the Amy Tangerine and some copper/rose gold ones since a few of the papers of have rose gold accents. One smallish sheet of stickers in the original kit is nowhere near adequate.I like a lot of options for small flat alpha stickers which I use in subtitles etc...not to mention needing plenty of camera stickers for layering. When you take into account the number of things I pile onto my layouts, the proportions of my kit become more understandable! I have lots of these from various places and made of different types of plastic. 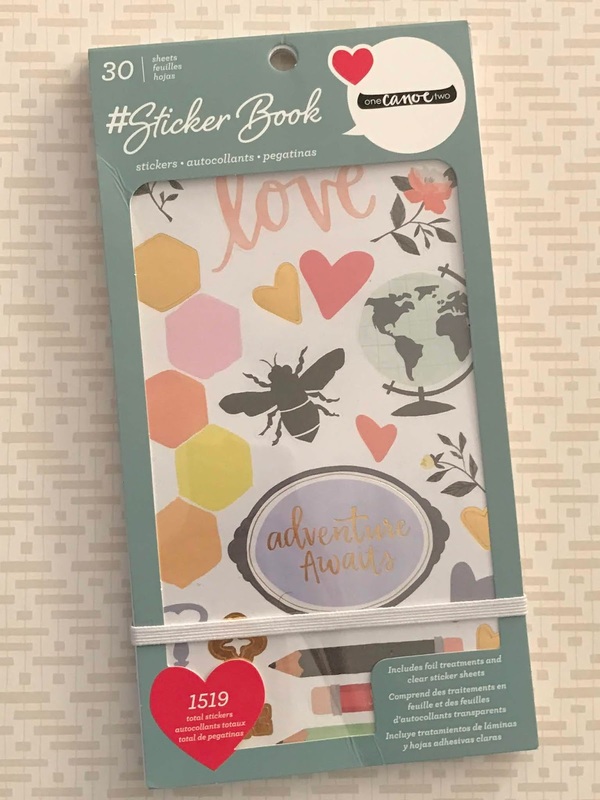 The product focus for September over on the REDISCOVER YOUR STASH group on Facebook is acetate and I declare these words count. I'm also throwing in some shapes from Studio Calico, cameras from Maya Road and I think the two Polaroids are from Basic Grey. Shimelle's puffy stickers from her "Little By Little" collection work not only in terms of colour, but bring in the critters that feature in the original kit. 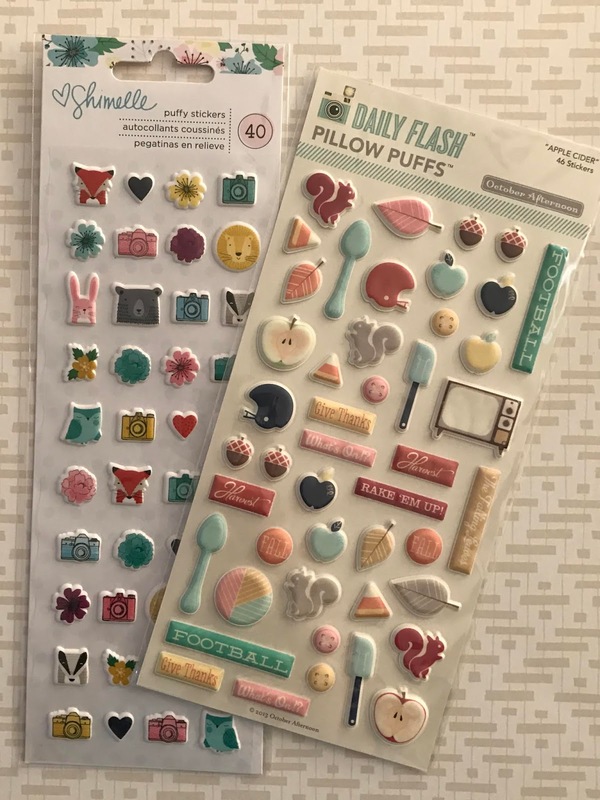 The Daily Flash puffy stickers from October Afternoon are actually autumn themed! I mostly chose them for the apples and baking motifs! I went with gold ones by American Crafts and multi coloured ones by Heidi Swapp, If I find I need some extra tiny stickers then I'll pull those in. Normally word stickers live on my desk so I just pull out the right ones as needed. I don't worry about going back into my stash because if it means a page gets finished then supplies in my kit will be reduced by definition. My stamp sets are stored in DVD cases. I always squeeze in at least 2 sets and cut them up if needed. This one is no exception. 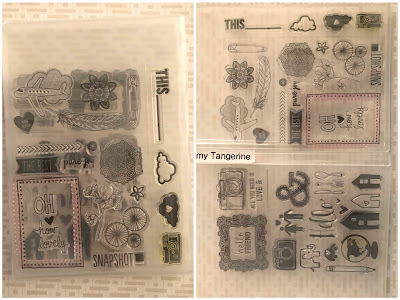 There are 2 Amy Tan stamp sets (Possibly "Sketchbook" and "Ready Set Go")and a third smaller exclusive AT stamp set that came in a Studio Calico kit. 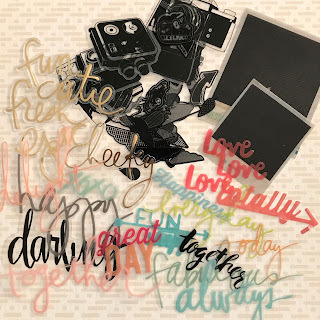 This type of stamp set is good to include in a scrapbook kit because it has a mix of words and images. 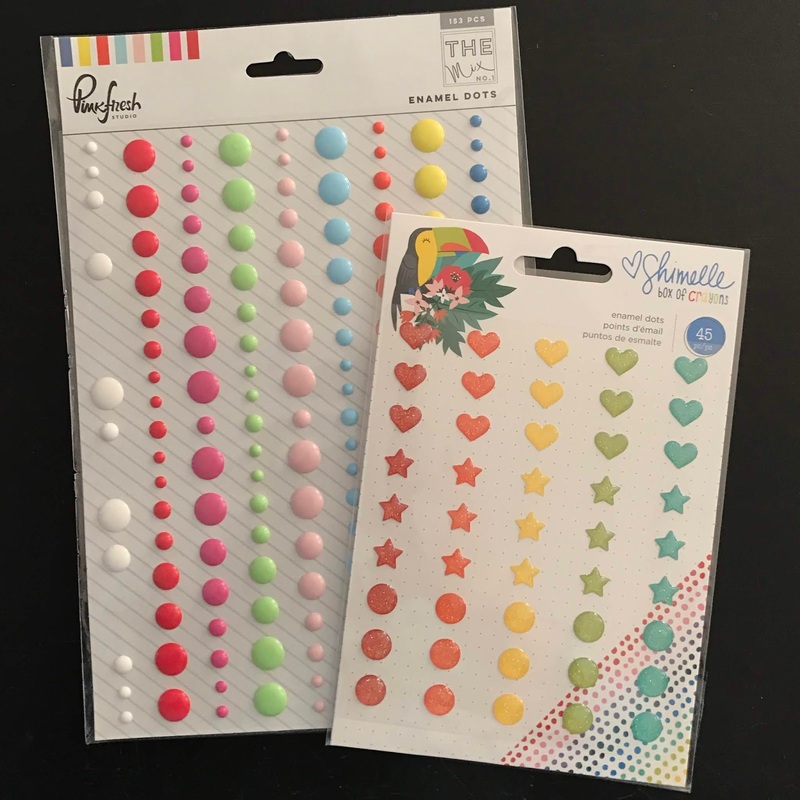 I picked this lovely large packet of enamel dots by Pinkfresh studio which I have used before and it has me covered for pretty much every colour of the rainbow! 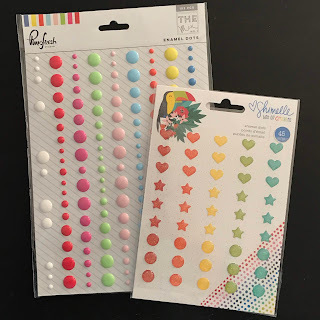 I also included a pack of glittery gems from Shimelle's "Box of Crayons"
I substituted the spray with an additional embellishment since I don't usually include ink or other mixed media (except stamps since I have plenty) in kits that I create. 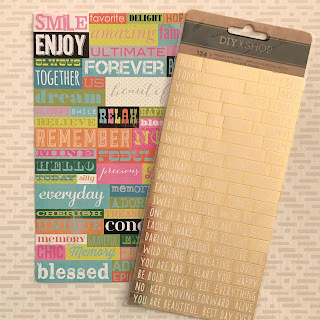 I use them as needed and consider them in the same sort of category as my paper trimmer! In this case I chose one of the American Crafts "designer" sticker books by One Canoe 2. The original kit contained some papers by 1 Canoe 2, so this is a nod to that along with having good colours, outdoorsy motifs and plenty of butterflies and flowers. 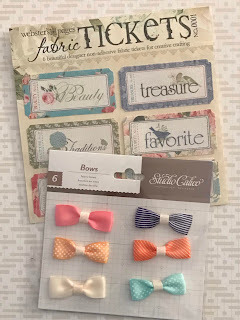 Since there is no shortage of paper in the kit, I went with fabric bows by Studio Calico from their "Atlantic" collection along with some fabric tickets by Websters Pages. I have quite a few packets of these and really should start putting them on pages. I love different textures on my layouts and fabric suits the feel of the kit very well as discussed earlier. 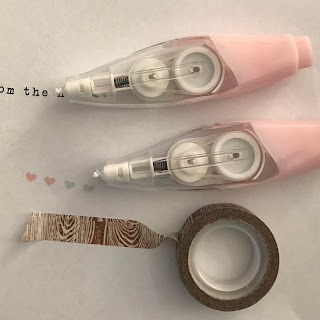 Can you believe I only picked a single roll of washi? 😲 I'm sure I'll end up adding more and I'm OK with that! Really really ok! 🤣 It's even one of my "special" Hambly tapes! I also added two Maggie Holmes rub-on pens. I always forget to use them. 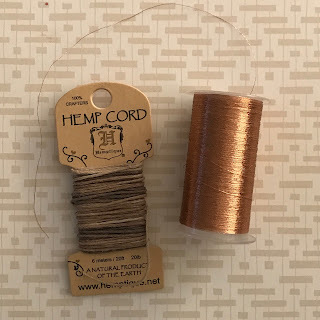 I picked some hemp cord which is lovely and rustic and the perfect answer to this kit along with a copper metallic thread for yet another texture! I do have orange ribbon, I have all the colours of ribbon, but I'm just not a fan of ribbon on layouts. I have seem some lovely ones...just not any by me! 🤣 Tulle does look gorgeous, though. I had this weird lacy bit of gold and white ribbon which is kinda along those lines.🤷 I just can't explain why I struggle with ribbon on layouts, but not on cards. 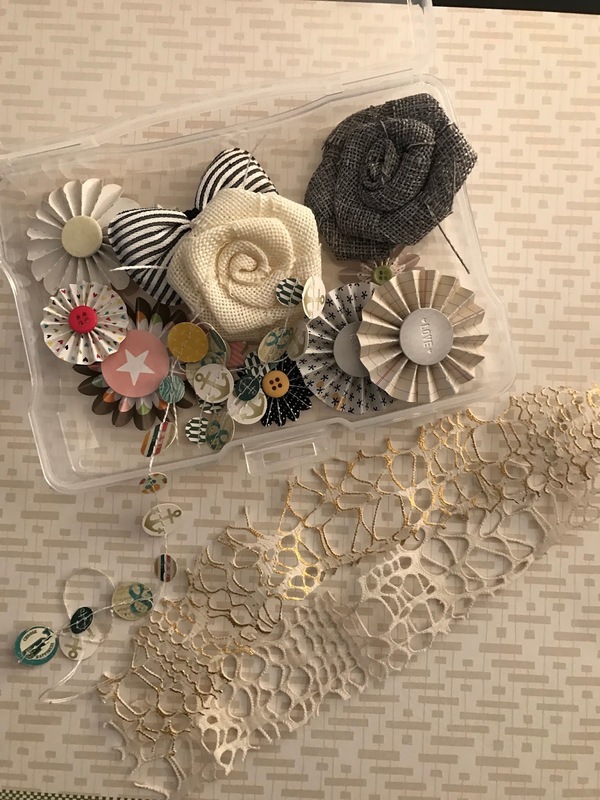 I also found this box of randomness - it had some bulky fabric flower embellishments by Maya Road, a scrap of Glitz garland, and some rosette embellies that no longer have sticky backs! 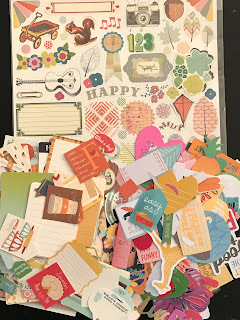 My die cuts used to be stored altogether, in just a single large container. When they outgrew this solution and it became too difficult for me to pick through them, I split them into rough colour groups. I needed a fast and easy solution to take them from and put them away again. I definitely don't have the energy for some kind of long and complicated storage system. When I first open a brand new package of die cuts, I try to keep them in the original packaging for a while and only integrate them back into my stash once they diminish quite significantly! The other thing I sometimes do is amalgamate die cuts from all different collections but the same manufacturer. This is what I did with all my October Afternoon die cuts and the more recent Amy Tangerine ones. They are both very different, so they should cover every style and theme of layout. I also ended up choosing an unused sheet of Crate Paper "Acorn Avenue" die cuts for something quite autumnal, but with a lot of green. 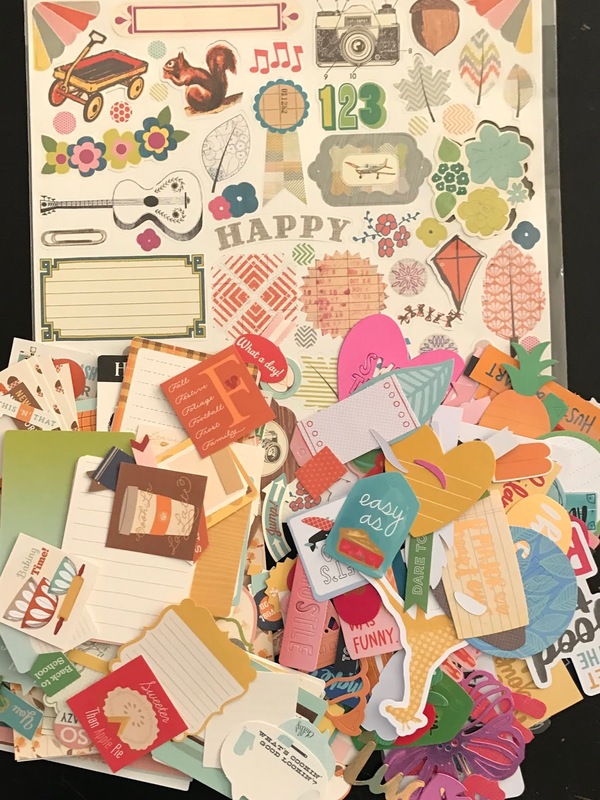 Any cut apart sheet or similar in my stash would have been cut apart a long time ago and integrated into my die cuts. 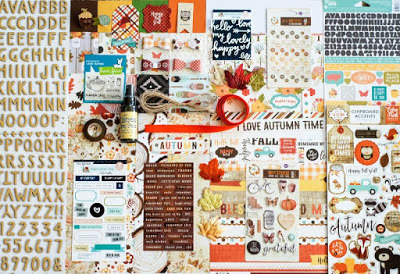 Instead I chose an October Afternoon sheet of label stickers, which actually looked quite like the original cut apart sheet. 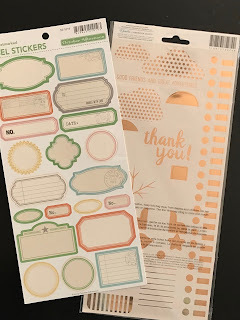 I also picked this cream and copper sticker sheet. It's one that i struggle to use, but the copper is so pretty and goes reasonably well with the rose gold elsewhere in the kit. The kit has 6 and this pack of Amy Tangerine leaves also has 6 left. But no glitter. This will have to be rectified. FAST! While I was rummaging in my drawer of leaves and flowers, I found a zip loc bag of random paper and felt flowers. 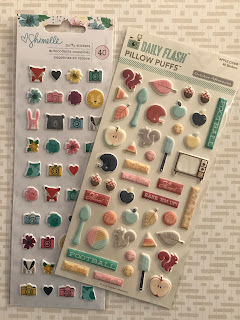 I know the felt ones are stampin up, but i'm not sure about the others. The colours are perfect and I want them used and gone. No way would i ever use enamel pins on a layout! My craft apron has a pin collection so if I have an enamel pin that's where it goes! I went with this pack of embellished paper clips from Shimelle's "Box of Crayons" Collection as a substitute. 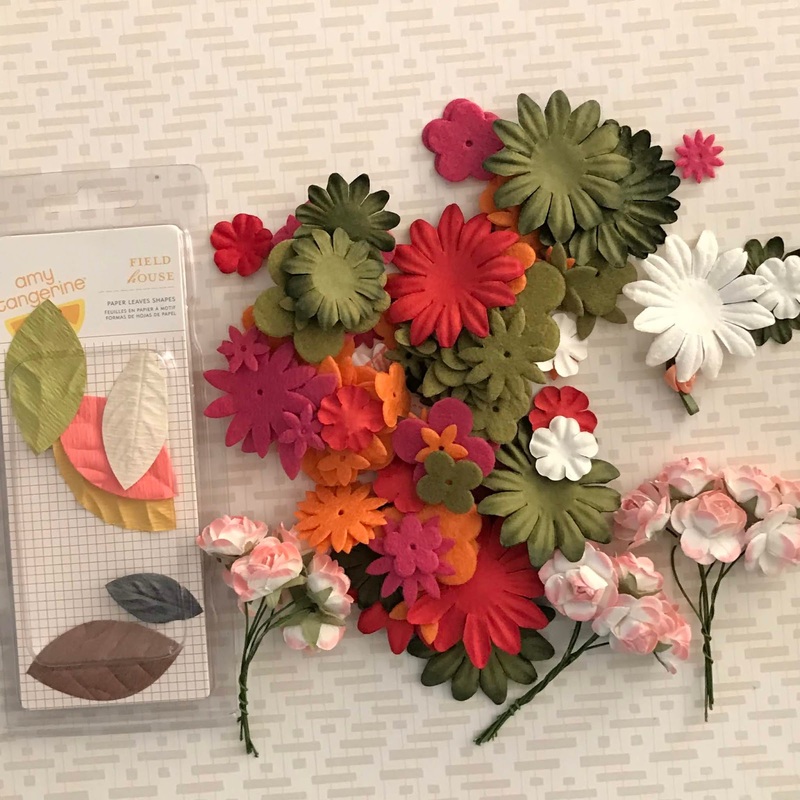 Very summery, but I need to have some such things to balance the autumnal elements. I also came across a bag of random flair badges. There doesn't appear to be any pattern in their selection, but they do seem to work well with everything else. Remember this snack tray that has popped up in my kits over the past months? It sits on one of side of the desk and I use it as needed. Then I discovered my overflowing box of frames and pile of doilies....the same will apply to those I'm afraid. So congratulations on making it all the way to end! 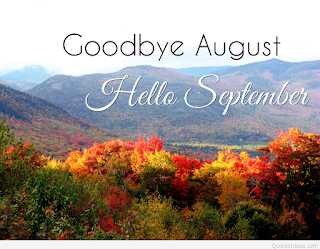 September being almost half over, I have no idea how many layouts I will end up making. 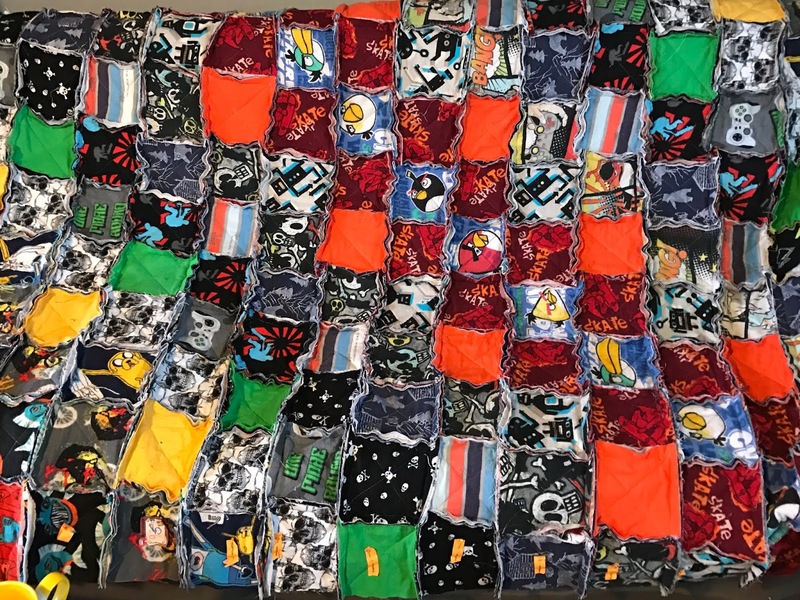 Love and safe stash diving! Wow, wow, wow! What an amazing kit that you have created! I could play with those goodies for quite a while! 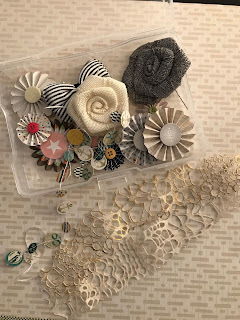 I love your mix of papers and your embellishments...love them all! I look forward to seeing what you create with it! Thank you, Lori! It's not my usual style, but I'm up for the challenge! 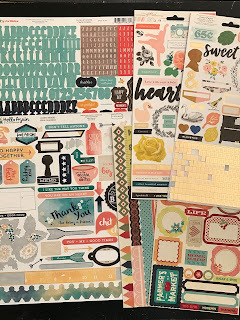 As I was reading through the blog and ALL the photos from your MEGA-huge kit, my thoughts echoed Lori's of Wow, wow, and wow!!!! Amazing! !--how you've suited it to reflect your other hemisphere location!!! and how you've coordinated a bazillion items from your inventory!!! :) Looks like hours of wonderful crafting time for weeks ahead!!! Good luck!!! Thanks for your kind words! 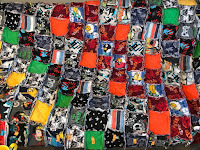 I wont get through most of it given the month is more than half gone, but I count every layout complete an achievement! I want it all...OMG I think this kit is my fav!!! awww that's such a lovely thing to say! Thank you! it's the analytical chemist part of me, I'm afraid! I can't get away fro it even when I'm trying to relax! That is one big kit! I take off my big kit crown and hand it to you! But there is oodles of stuff to love in it and many papers that I have in my own stash and should have thought about including! It's a fabulous mix of product and I'm happy you made it work for your own season down there! Pumpkins are not a thing here in Germany either really. I love how you explained each section and gave us the full run down - no wonder it took all week to write the post. Fabulous and fabulous and more fabulous! Funnily enough I actually ended up finding a photo for a pumpkin layout! Probably the only one I will ever have! Okay - first of all I have a serious case of stash envy. Secondly I have just enjoyed a delightful guided tour through your a-ma-zing kit. I really hope you get to run all of those goodies through your fingers & make wonderful things! I finished with three layouts which was less than I hoped, but probably more than should have been realistic with my health. I plan to start with the leftovers when it comes to building October's kit. What a full and lush kit! 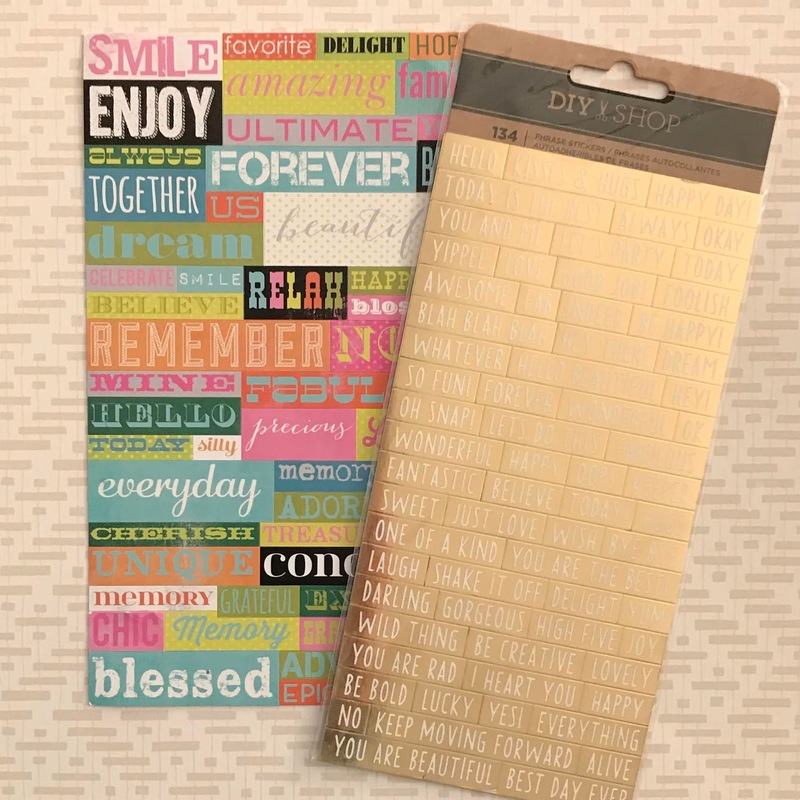 Your description of how you pulled all those paper made me smile - it's hard not to get carried away and include so many "perfect" items! And your snack tray of goodies is awfully tempting, too. I hope you have lots of fun with your kit - even though September is drawing to a close, I hope you'll keep working with it for a while. My cunning plan is to start with the leftovers when it comes to building October's kit. That way some of it will have a second chance!